In order to drive IT operational excellence, businesses must govern employee and partner access to the extended enterprise, so that they have only the appropriate access rights that are essential to their job roles. Reducing IT risk and demonstrating regulatory compliance is not optional. Understanding and managing users' access to critical systems and applications in large organizations is a complex and challenging effort. In today’s environment, organizations must meet these requirements as quickly and efficiently as possible. However, many of the processes used to verify and audit users' access rights and entitlements are often just as complex, expending valuable time and money without mitigating risk. • Can you effectively analyze millions of entitlements to determine which are not needed? Redundant? High risk? • Can you verify 100’s or 1000’s of regulatory policies in seconds? • Can you automate compliance reviews without legions of programmers and administrators? 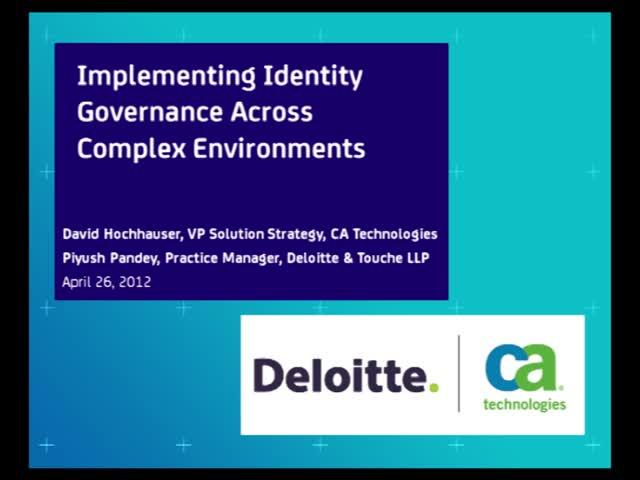 In this webcast, Deloitte & Touche LLP and CA Technologies will discuss the challenges of providing effective visibility into user access rights and entitlements, and automating identity governance processes to save time and money. Insights and leading practices gained from customer experiences will be shared, together with CA Technologies solutions, in order to provide attendees with useful guidance.